This is Day 29 of our 31 Days of Less & More challenge. To read all the posts in order, start with Day 1, then visit the Overview Page to see the entire series. I have to admit, I am a little bit lot OCD when it comes to surface clutter. I actually can’t stand anything on my tables, dressers, or counters. The most I can tolerate is a completely functional addition, such as a lamp on the nightstand or a globe and a jar of pencils on the homework desk. And even those kinda bug me. Yes, I realize that some people enjoy creating lovely, decorative vignettes on their surfaces, and I can appreciate their beauty, at least in theory. When I go visit Edie I am in awe of her incredible, fun, & eclectic style. Her house doesn’t just look like it belongs in a magazine, it actually was featured in Better Homes & Gardens last year. As much as I love visiting, I’m quite certain I would go insane if I actually lived at Edie’s house. My little brain just can’t handle all that stuff. Even my poor husband does not share this compulsion for every surface in our home to be perfectly clear. He is quite content to create little piles and then just let them sit there, no matter how dusty the get or how cluttered they look. Just sitting there. Doing nothing. Forever. Driving. Me. Crazy. Easier to keep clean. Less stuff on your surfaces, fewer throw pillows and accessories and less furniture in general means there is less to dust or wipe down or rearrange or pick up when it inevitably falls into disarray. It just logically goes to follow that the less you have, the less you will have to clean. Easier to find things. Keeping your things to a minimum makes possible to sort, organize, and store the things you do have because it is easier to find a proper place for everything. Cupboards, counters, and drawers that are not jam-packed with things you don’t really need make it so much easier to locate the things you do need when you need them. Feels more restful. Again, this might just be me, but surfaces free of clutter just feel calmer and more serene. When my surfaces are clear I can breathe a little easier, stay focused on the tasks at hand, and even sleep better. 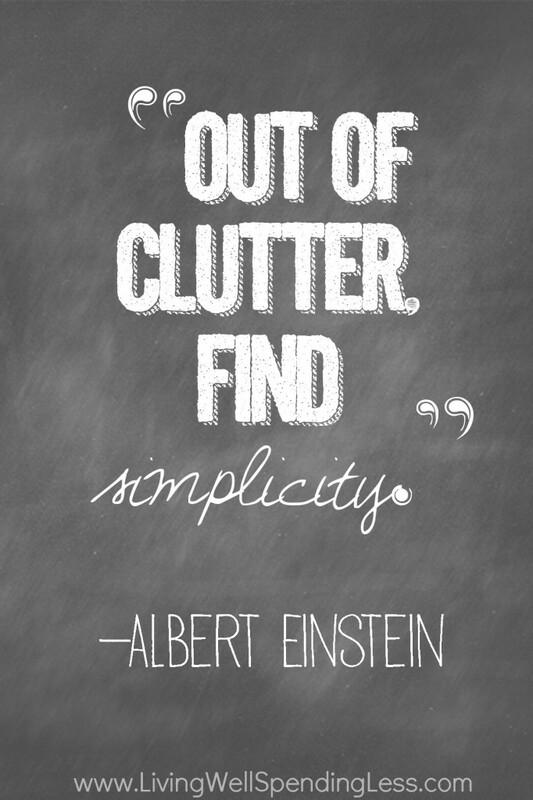 For more practical tips on how to stay clutter-free forever, be sure to check out this post! Be sure to read Edie’s corresponding post, More Art. Take a walk through your home and ask yourself, “What is the unspoken message my home sends?” Consider following in the footsteps of our friend Myquellin (The Nester) and pick one room in your home to completely clear the surfaces. Take everything off of every horizontal surface, then leave it that way for at least 24 hours, just to see how it feels. Once you’ve experienced a whole day of clutter-free living, take some time to put back only the things you love. Take before and after photos and share on Instagram or Facebook with the hashtag #31DaysLessMore. Where do you fall on the clutter spectrum? Completely agree Ruth! I have the same mindset about clutter and piles of things laying around. I try to keep my decor simple, yet functional, and less stuff for me means less cleaning and caring for. Thanks for this great reminder and I hope you have a wonderful day! One challenge I face is when family visits. Grandparents bring with them loads of goodies from toys to candy for my 2 year old. When they leave, I look around at some of the items in appreciation as they are nice things but then I realize that with those few nice things came about 20 new things I already have in one form or another and they are literally stacked up on all the surfaces I can see. Do you have any advice on how to handle these types of situations delicately or do you just head to the thrift store after they leave? Hello Kim, I deal with this as well. We’re 8 hours away from our family, so when they come to visit or mail us items, they are very giving and want to spoil us. I’m very grateful for their gifts and always let them know how much I appreciate them. As thankful as I am, I don’t keep everything they give to me or our family. It really becomes too much and we don’t always have the room or need for it. Especially if it’s things we already have, wrong size, not our style, etc. * Sell to Thrift Store, Ebay, Craigslist, etc. I am a packrat that longs to be clutter free. So you inspired me to go clean off the kitchen counters. They have been uncluttered and wiped clean. That does look and feel good. Ha ha, wow, you really seem to have low tolerance for clutter. I must admit though, as much as I like free space and do like to see a little something on my walls or so. Not too plain but not too cluttered, either! Thanks so much for this post.